June 21st marks National Indigenous Peoples Day. This national day of observance was previously known as National Aboriginal Day up until this year. This change in name comes with a reminder for us to revisit the history of this day and its meaning. National Aboriginal Day was first made official in 1996 as the result of consultation with, and support by, various Indigenous groups such as the National Indian Brotherhood (now the Assembly of First Nations or AFN), the Sacred Assembly, and the Royal Commission on Aboriginal Peoples. In 2001, the National Aboriginal Day Act was passed by the 14th Legislative Assembly making the day a formal statutory holiday in the Northwest Territories. In May of 2017, a similar act was passed in the Yukon. On June 21, 2017, the Prime Minister, Justin Trudeau, announced that the name would be changed to National Indigenous Peoples Day. This new name reflects the terminology used in the UN Declaration on Rights of Indigenous Peoples. In an AFN news article, Perry Bellegarde, the national chief of the Assembly of First Nations, welcomes the change, saying that it helps to show “movement towards recognition and acknowledgment that these lands are the homelands of Indigenous nations and cultures”. One of the goals of National Indigenous Peoples Day is to celebrate the cultures of First Nations, Métis, and Inuit people in Canada. Our team is extremely excited to be headed to Ottawa for the Summer Solstice Indigenous Festival Education Day on June 21st. Education Day is a gathering of 5,000+ teachers and students from the region for workshops, cultural activities, and more. This event is part of a 3-day festival taking place from June 21-23, 2018 in Ottawa. 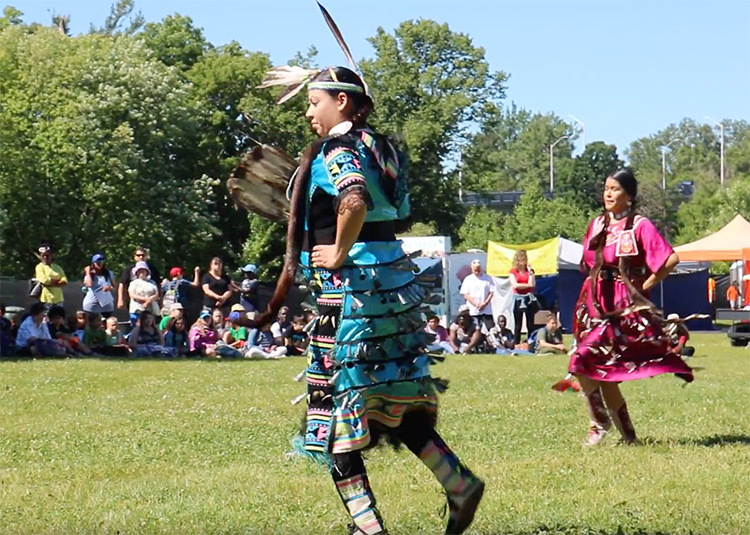 This family-oriented, multi-disciplinary arts festival attracts 40,000+ visitors a year and features culinary events, cultural activities, musical performances, and an International Pow Wow competition that features some of the best singers and dancers from across Turtle Island. It represents the cultural diversity of the urban Indigenous community and has full participation by First Nations, Métis, and Inuit artists. Celebrations will be happening across Canada under the Celebrate Canada program and will include regional Pow Wows, food, art, as well as other celebrations and ceremonies. To find a National Indigenous Peoples Day event near you, check the extensive list on the Government of Canada’s website. The other goal of this day is to celebrate the contributions of Indigenous peoples across Canada. Many of the foods we eat and the activities we partake in can be traced to Indigenous invention and discovery. Not to mention the more recent contributions made by Indigenous peoples to science and technology, art, politics, and other fields. 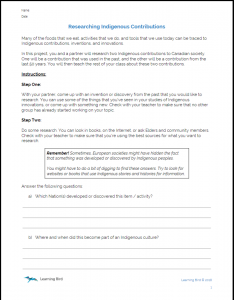 In the spirit of National Indigenous Peoples Day and raising awareness of Indigenous contributions, our team at Learning Bird has created a free Resource Kit for teachers to use in their classrooms. This Kit contains four resources that introduce a variety of everyday items your students likely use or have used which were invented or discovered by Indigenous peoples in North America. Students will have the opportunity to learn about the origins of some of these items, and will also research a past contribution and a current contribution. Students will then teach their classmates about what they have learned. Through these activities, students will become aware of how many items they use can be traced back to Indigenous innovation and they will learn of the important contributions that have been made both in the past and in present times. These lessons are geared towards a middle school class, although the research project would be a good addition to a high school class as well. These resources are free to use and share in your classrooms and with your colleagues. Although the school year is wrapping up, you may wish to bookmark this page for next year to see how they may fit with your year-plans for the 2018/2019 school year. 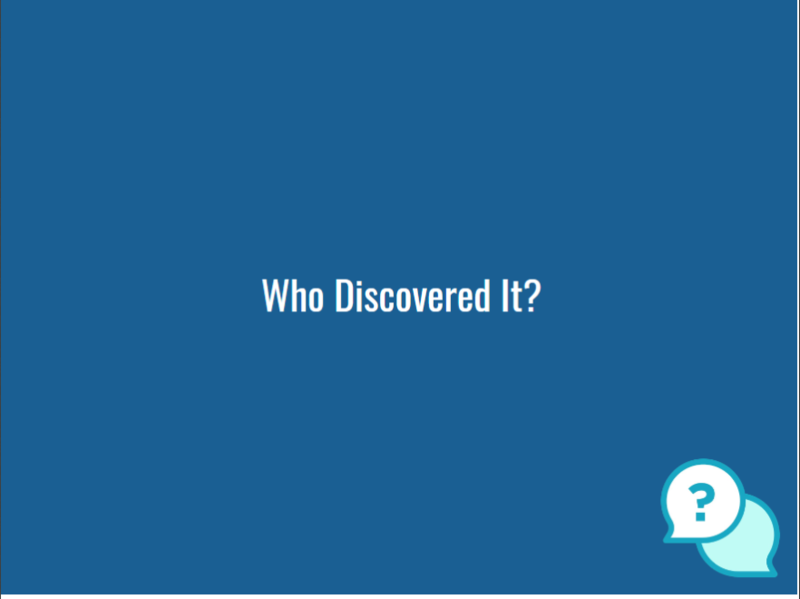 ‘Who Discovered It?’ is the first resource in this Resource Kit. It is a presentation which will prompt students to understand how many common foods, technologies, games, and other items were first invented or discovered by Indigenous peoples from across North America. Students are shown a variety of images of everyday items and asked to guess which items were discovered or invented by Indigenous peoples from North America. It’s a trick question though because all the images they will see were. Students will be reminded that what they have seen in this presentation are just a sampling of the important contributions made by Indigenous peoples. ‘Indigenous Contributions: Food and Health’ and ‘Indigenous Contributions: Transportation, Games, and Other Items’ are the second and third resources. They are both videos which will teach your students about the origins of a few everyday items and activities. In ‘Indigenous Contributions: Food and Health’, students will learn about food and health items. In ‘Indigenous Contributions: Transportation, Games, and Other Items’, students will learn about transportation during both winter and summer, as well as about games, and other items. 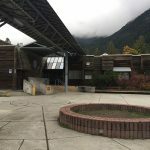 Both videos ask students to evaluate the food and health items and activities they do to see how their lives would change without the contributions of Indigenous peoples. ‘Researching Indigenous Contributions’ is the final resource in this Resource Kit about Indigenous contributions, innovations, and inventions. It is a handout which guides students through a research activity. Students are directed to research one contribution from the past and one contribution from within the past 50 years. Students are then asked to present what they’ve learned to their classmates. Finally, students will reflect on what they’ve learned through their own research, and from listening to classmates’ presentations. And the most important potential resource – Reach out to the Indigenous communities near you and speak with Elders, Knowledge Keepers, and other community members about where else you can find credible resources for your classroom. Learning Bird works with Indigenous schools and communities from coast to coast to collaboratively create classroom resources that integrate language, culture, examples, and perspectives for students in grades 6-12. If you are interested in learning how we can work together to create content that shares your Nation’s stories, contact us. If you are part of a public school board and are looking to integrate Indigenous perspectives into your classrooms, we are also happy to help. Contact us at achieve@learningbird.com or call 1-888-844-9022.